Programs & Classes Youth Development Initiatives (YDI) This comprehensive, co-educational intergenerational youth development program serves youths ages 10-18, with a special emphasis on recruitment and intake of youth at the sixth-grade level. It is designed to promote health and wellness, build self-esteem, develop leadership skills and master competencies that foster success in school, the community and ultimately in life. • Educational development • Academic lab - the setting for tutorial sessions, mentoring, computer literacy and homework - will be conducted weekly. Tutoring will be offered Tuesday and Wednesday nights from 5:30-7 p.m. at the North Greenwood Library. • On Thursday nights, program members meet with parents to communicate academic updates, attendance, homework and behavior checks from the school portal for their children in the school system. They offer strategies that will assist parents in helping children stay on the path to academic success. • Program tutors are professionals who are provided by the Advanced Learning Center. • For more information, visit pinellasydi.org, or call 442-5550. Neighborly Senior Café Site - Neighborly Care Network As part of the Neighborly Care Network, North Greenwood offers a senior dining site that provides complete hot meals approved by a licensed dietitian that are suitable for those with high blood pressure and heart disease. This program provides nourishment not only for the body, but also for the soul, as this program allows seniors to interact with others. For more information, call 593-9444. Greenwood Winter l Spring 35 Organized Sports Clearwater Basketball Club This club offers leagues, training and competitive level (AAU) teams for boys and girls ages 9-17. Call for tryout times. Participate in AAU and YBOA tournaments. • Tony Wilson, 439-8669 • Athletics Office, 562-4802, ext. 3813 North Greenwood Youth Basketball League (grades 3-8) • Mon., 6-9 p.m. • $50 (W) / $55 (W/O) • $20 with reduced lunch or $15 with free lunch • Call 462-6276 or 439-8669 for more information Pickleball Pickleball is a fun, active game that is played on a badminton court with the net lowered to 34 inches. • Mon.-Fri. • 8 a.m.-1 p.m. • Free (PLUS/SS) / $2 (W) / $3 (W/O) Table Tennis • Tue. 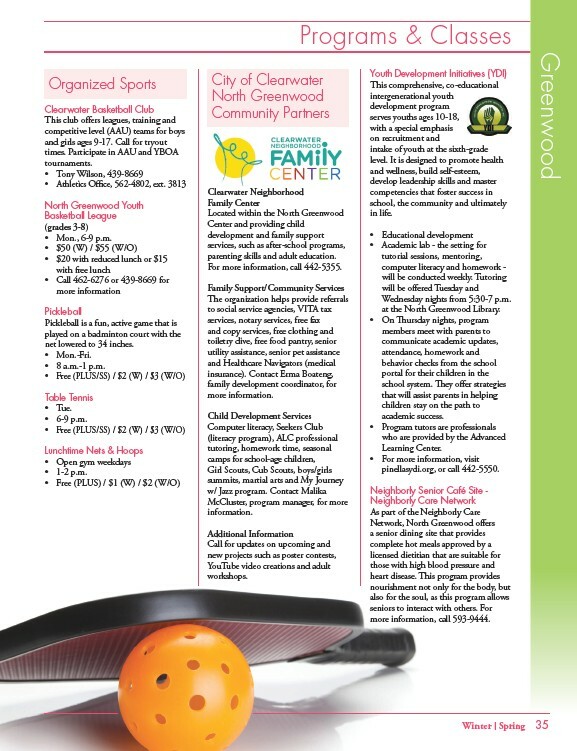 • 6-9 p.m. • Free (PLUS/SS) / $2 (W) / $3 (W/O) Lunchtime Nets & Hoops • Open gym weekdays • 1-2 p.m. • Free (PLUS) / $1 (W) / $2 (W/O) City of Clearwater North Greenwood Community Partners Clearwater Neighborhood Family Center Located within the North Greenwood Center and providing child development and family support services, such as after-school programs, parenting skills and adult education. For more information, call 442-5355. Family Support/Community Services The organization helps provide referrals to social service agencies, VITA tax services, notary services, free fax and copy services, free clothing and toiletry dive, free food pantry, senior utility assistance, senior pet assistance and Healthcare Navigators (medical insurance). Contact Erma Boateng, family development coordinator, for more information. Child Development Services Computer literacy, Seekers Club (literacy program), ALC professional tutoring, homework time, seasonal camps for school-age children, Girl Scouts, Cub Scouts, boys/girls summits, martial arts and My Journey w/ Jazz program. Contact Malika McCluster, program manager, for more information. Additional Information Call for updates on upcoming and new projects such as poster contests, YouTube video creations and adult workshops.